With the dollar in the gutter, fuel prices on the rise, and airlines charging for everything from snacks to blankets, travelers are more than ever looking for some way to defer the cost of their trip. One easy way to do this is simplify the way you eat when you roam; at home you don’t go out to restaurants for three meals a day, so why would you do this when you are traveling? It’s easy to eat cheap, and you don’t even have to skimp on protein, vitamins, or nutrients. These are my favorite low-cost travel foods; stock up at the biggest grocery store you can find and have breakfast in bed, lunch on the train, and dinner on the side of a mountain.· Peanut Butter: I never leave home without it; with a jar of PB in my bag I know that I will always have a protein-packed sandwich that is kind to the stomach. It is usually very easy to find some sort of bread anywhere in the world, and you can always add some banana, honey, or jam to feel extra special (and these items are usually available for free at hotel breakfasts and restaurants- grab a few extras). · Coffee: Traveling with a single serving French press and a baggie of ground coffee beans might seem extreme to some of you (who obviously don’t live in Seattle), but for this caffeine addict, I know that every morning I will want a hot, steaming cup of the sweet nectar of life. If I don’t bring it with me, I will buy it, so I always have my fix handy, saving me lots of money on lattes. · Tuna: Another cheap source of protein, tuna is handy and filling. Mix it with a couple of little mayo packets, put in on crackers and eat with a random veggie like a cuc or tomato. Instant tuna salad! · Bananas: My yellow friends are great for traveling because they come in their own casing and have a bunch of potassium, which is great for leg cramps from hiking up mountains, walking cobblestone streets, and swimming with sharks. · Protein Bars: Okay so this is a no brainer, but I always pack a few Clif or Luna bars in my bag for those times when your hunger is overriding your brain and you need something in your belly in order to function. Try out a few varieties before you leave home and find your favorite. · Eggs: You have to have a kitchenette where you are staying to take advantage of this one, but eggs are also high protein, cheap, and fast and easy to cook. Throw in some toast and coffee and you have yourself a “Paris dinner” (Which is what I ate almost every night living in the very expensive city). · Nuts and Granola: These are great for snacking; you can carry around a little plastic baggie and the protein will keep you going for one more hour of sightseeing. · The Bread, Cheese, and Wine Picnic: Get it out of your head that you need meat for it to be a meal. If you can picnic with the three items above, you will not only save money, but you’ll also be subsisting as our humans did for centuries, before they had burgers and fries. · Chocolate: No food list is complete without a mention of the candy crack; a stashed bar of chocolate or M&M’s in your bag might not satisfy your hunger, but it will keep lift your spirits and keep you going. Your mental health is just as important as your physical health when you travel, and chocolate always brings a smile to my face. The best thing about eating most of your meals on the cheap in Europe is that you will be saving enough money to splurge on a really nice meal. It doesn’t necessarily have to be expensive, but if you treat yourself to a dinner of genuine regional specialties it will give you an internal insight unavailable to those who just look. 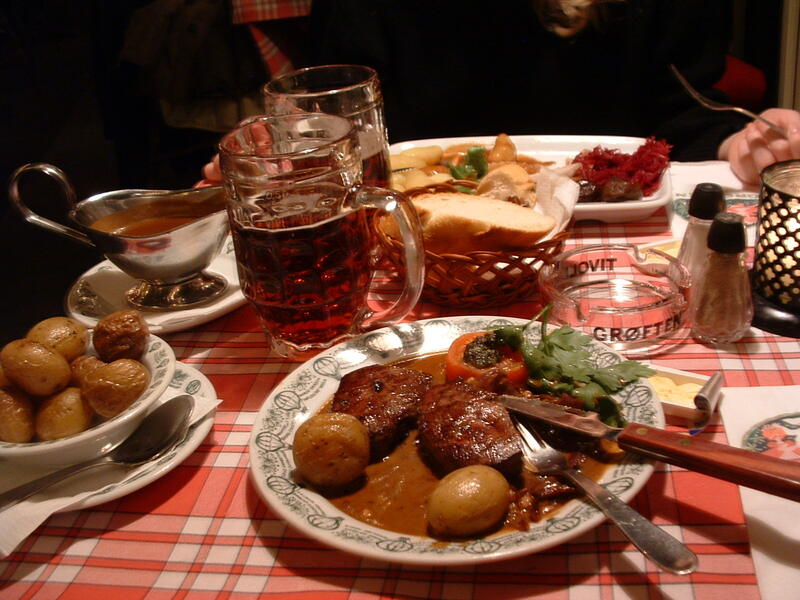 Categories: Food & Recipes, Trip Planning Help & How-To's | Tags: eat cheap in europe | Permalink.